The Louisiana Senior Rx/Aging and Disability Resource Centers, a free counseling service offered in coordination with the Governor’s Office of Elderly Affairs, is encouraging all Medicare beneficiaries to update their coverage plans before December 7, 2016. Amended Rules for Out-Of-Work Journeymen – Click here to learn more. Summary of Benefits and Coverage Now Available for Download – Click here to learn more. The Plumbers and Steamfitters JATC has a training program consisting of classroom instruction (Two nights per week, two semester per year) and on the job training. Apprentices earn raises every six months through completion of courses and excelling in job performance. Upon successful completion of the five-year program, the Apprentices become Journeyman as Plumbers, Pipefitters, or HVACR Service Technicians. (All licenses and certifications are obtained prior to completion). 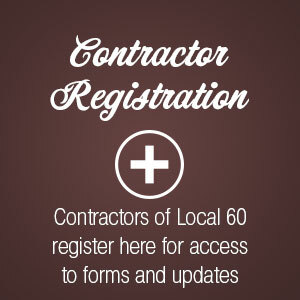 Local 60 and its members are committed to helping the community grow. We do our part by participating in community events and lending a helping hand when needed. THIS NOTICE OF HIRING AND REFERRAL PROCEDURE IS BEING PLACED ON UNION’S BULLETIN BOARD IN ACCORDANCE WITH FEDERAL LAW. DO NOT REMOVE OR DEFACE. SECTION 3: A journeyman having been laid-off should register at Hiring Hall the following work day. All registrations must be done in person between 7:30 a.m. and 8:15 a.m. by filling out an Out-of-Work slip and signing Dispatcher’s Book. (Companies shall supply an official termination slip or letter of termination on company stationary.) Effective January 1, 2013, only plumbers that have a current Louisiana State Plumbing License may register on the ‘Plumbers’ Out-of-Work list and only welders that have a current UA 21 welding certification may register on the ‘Welders’ Out-of-Work list. When two (2) or more registrants of a respective craft report in on the same date, there shall be a drawing for numbered places on their respective craft’s Out-of-Work list for that date. SECTION 7: If, after registering Out-of-Work, a journeyman fails to accept a work referral on three (3) separate occasions within ninety (90) days, not including ‘Not for Rehire,’ or fails to accept a work referral in the next 365 calendar days, his name shall be removed from the list. At his convenience, he may re-register. SECTION 9: Any registrant who accepts a work referral and fails to comply with the contractor’s initial hiring procedures and/or policy shall be placed at the bottom of the Out-of-Work list.